It was a bit more of a lackluster gaming session than I would have liked, but D'Arlee is a civilized world with high law levels, and the Travellers are all, for the most part, law-abiding Imperial citizens. So, the day after Morgana's welcome home party the group returns to the starport to review the ship and the new Navy crew. The NPCs were rolled by RPGSuite, and it took me a while to get 3 Navy engineers. I also rolled for random race and gender, and ended up with a human female, Vargr male and Aslan female. I've only the 1 character card so far, but will probably make the others so I can use them when I am "playing" those characters. Lt Oeg "Egg" Aghdzoksdhaekhsfudzzong is the chief engineer, a Naval Academy Honors graduated who is serving in his 3rd term. He has been on diplomatic missions, foiled a major crime on board a Naval vessel (hmm, perhaps something to do with the Saki-Ryant Consolidated Networks Group? ), and had advanced training. It was during this year that he picked up a pristine 1092 Ling Standard mk6A air/raft. It has been somewhat embellished outside of Navy norms with an interestingly contrasting paint job and some quite unnecessary fins that "really make it go faster". It was stowed in the cargo area of the lab ship with permission from the captain. Lt Oeg has wide experience in all engineering systems. He also enjoys flying fixed and rotary wing craft. Petty Officer 3rd Class Shenna Barrick has risen fairly quickly through the ranks working in the Engineering/Gunner sections of the Imperial Navy. A tiny woman with green-tinged hair (within the boundaries of Naval culture and protocol), Shenna specializes in engineering power systems, and tinkers with Oeg's air/raft to see if she can get a better power ratio. She can actually fly it, whereas Oeg is still learning grav vehicle. She participated in the 4th Cytec Hegomemy Convention, representing the D'Arlee Naval Group 1134 along with the rest of her crew. She has actually met with the reclusive Cytecs. 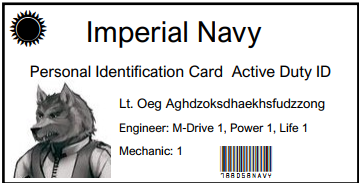 The final member of the Naval Engineering group for the lab ship is young Crewman Heeahfi "Sneezy" Fteftaistiysiyei. She also gradated the Naval Academy of D'Arlee, and has published in the Naval Archives a treatise on ancient weapons, a comparison of Human and Aslan ancient weapons. However, in her first term her immediate supervisor made an error that caused a rapid decompression in a cargo hold, and killed several crewmembers. Sneezy was blamed initially but the truth did come out, leaving her still in the Navy. As a partial recompensation she was given a membership in the Traveller's Aid Society. She has not yet decided if this will be her final tour of duty. She specializes in life support.